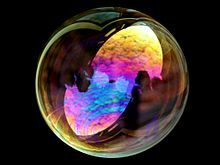 Why is a soap bubble round? Because it is the most energy efficient configuration. Similarly, on your planet I look like you; on K-PAX I look like a K-Paxian. I have arrived. My travels are over for the time being. K-PAX is a 2001 science-fiction comedy-drama film about a mental patient who claims he is an alien. Directed by Iain Softley. Written by Gene Brewer and Charles Leavitt. You'd be surprised how much energy is in a beam of light. I am from K-PAX. Now if you'll excuse me, I have a beam of light to catch. I'm an alien. Don't worry, I'm not going to leap out of your chest. A reference to the creatures in the film series which began with Alien. What Einstein actually said was that nothing can accelerate to the speed of light because its mass would become infinite. Einstein said nothing about entities already traveling at the speed of light or faster. You know, for an educated person Mark, you repeat things quite a bit. Are you aware of that? Your produce alone has been worth the trip. Let me tell you something, Mark. You humans, most of you, subscribe to this policy of an eye for an eye, a life for a life, which is known throughout the universe for its stupidity. Even your Buddha and your Christ had quite a different vision; but nobody's paid much attention to them, not even the Buddhists or the Christians. Doctor. Patient. Interesting human distinction. For your information: All beings have the capacity to cure themselves, Mark. This is something we've known on K-PAX for millions of years. Doctor — Doctor — Doctor — Doctor. Tell me how many doctors are there on this planet? I take it my calculations help explain the perturbations you've been seeing in the rotation pattern of your binary star, but have been unable to explain until… this moment. She says she doesn't like it when you hide her favorite tennis shoe, and she doesn't hear too well on her left side, so don't sneak up on her anymore. I would say you're in need of a Thorazine drip, Doctor. Something happened. That's why he called me. He calls me when something bad happens. I travel light. That's a joke, Mark. You humans — there's just no sense of humor. There's enough life on earth to fill fifty planets… plants, animals, people, fungi, viruses… all jostling to find their place. Bouncing off each other, feeding off each other… connected. Nobody wants. Nobody needs. On K-PAX when I'm gone, nobody misses me. There would be no reason to. And yet I sense that when I leave here… I will be missed. I will admit the possibility that I am Robert Porter, if you will admit the possibility that I am from K-PAX. Now if you'll excuse me, I have a beam of light to catch. Now that you've found Robert. Please take good care of him. I want to tell you something Mark, something you do not yet know, but we K-Paxians have been around long enough to have discovered. The universe will expand, and it will collapse back on itself, then will expand again. It will repeat this process forever. What you don't know is that when the universe expands again, everything will be as it is now. Whatever mistakes you make this time around, you will live through on your next pass. Every mistake you make, you will live through again, and again, forever. So my advice to you is to get it right this time around. Because this time is all you have. Tell me… uh, do you know of any missing astro-physicists? Who is it this time? Jesus Christ or Joan of Arc? Let's hope extra-terrestrials qualify for Medicaid. He's the most convincing delusional I've ever come across. There it is. Robert Porter. Drowned. His name is Robert Porter. Whenever you're ready, I'll be waiting. prot told me to find the Bluebird of Happiness… It's a task. The first of three. I know... You're the bluebird. After one month, his amnesia and his delusion has persisted. He claims to be not human. A visitor from another planet. Wow. He looks like Data. I put up with the stink in this place for ten years. I want to get out, if you know what I mean. I used to be the doorman at The Plaza — fif-fifteen years — that's when I started to notice it… The smell. They all stank. I, I tried to tell them, but, uh… they put me here. And um, this, this place smells worse than all — except for you. You, you don't smell. So I figured you could help me. prot told me to find the Bluebird of Happiness… Its a task. The first of three. Patients do not escape from this institution. They don't escape. I'm going to have a great time explaining this to the state board. I've got psychotics on the fourth floor packing up their sneakers because they all think they're going off to K-PAX. Find him. Is the spaceman here yet? You know what a family is? You worry. They don't tell you that you know. Quiet type. As I recall he was a real smart fellow… a brain. Strong as a horse though — and worked as a knocker. The sheriff of Robert Porter's town, referring to his occupation as a killer of cattle in a beef processing plant; the authors of this work are perhaps also making some allusions to knockers, mythical creatures in Welsh folklore. Mark Powell: If it's such a terrible experience, how do you reproduce? Prot: As carefully as possible. Mark Powell: What happened in there? I mean...he could be a savant. There are savants who've painted flawless copies of Rembrandts who couldn't remember their own names! You don't believe him, Steve? Steve: I don't know what I believe, Mark...but I know what I saw. Mark Powell: Where the hell have you been? Howie: You never gave me my last task. What's my last task? Prot: To stay here — and be prepared — for anything.